In past posts, I’ve referenced my love of all things local, from local business to local art, but among the things I am most enthusiastic about is the idea of local food. This makes such good sense - if you can eat food that hasn’t been trucked long distances, which hasn’t been steadily losing nutrients through a long process of transportation, the more certain we can be of its honest benefit to us. This idea has lead me to take an avid interest in discovering those places in our city where you can get great local food. Restaurants, for one thing and local retailers as well. Let's look at some market type places to shop for local foods. Before I did a little digging, I had no idea what my options were for good, local foods. Farmers markets are available, but which were the best? For a long time I drove a long way to get to a Whole Foods or a Fresh Market. And as much as I find shopping in places like The Fresh Market to be a utopian experience with their good smells and classical music, they can be something of an over-priced misnomer in my opinion. If you look at the labels on most what is sold there, almost none of it comes from anywhere near by, which makes me pretty skeptical about how “fresh” it can actually be. And, the fact of the matter at least for my family, is that the grocery bill has to fall within a certain number every month, or I can’t sustain the habit and those luxury stores were pushing my limits every week. There is, however, the evil other side of grocery store utopia; grocery store hell. I have belly-deep dread for wading through the cold fluorescent maze of a “ regular” store, already crowded with distracted, tired people. And surely, if the food at Fresh Market isn’t really the gold standard of good and fresh, I don’t even want to know where most of this food comes in. This paradox is why it became so important for me to figure out where I can go and buy good, healthy food that is as good for the environment as it is for my family. 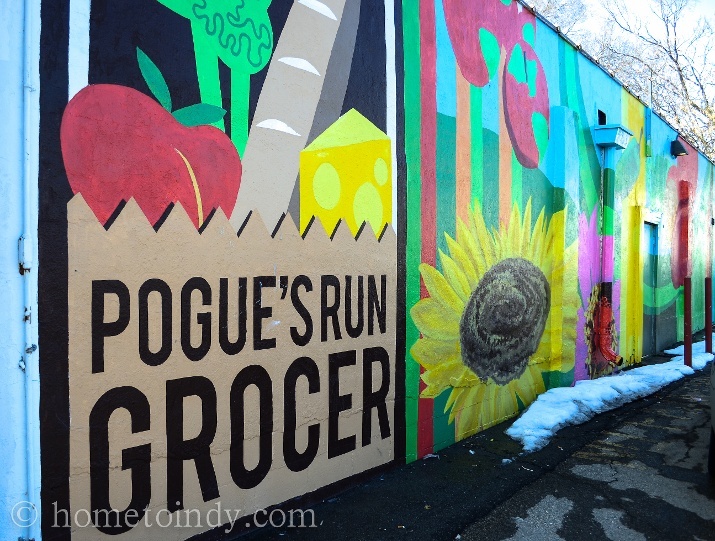 I’d like to start with one of my all-around favorites for local and fresh and that is Pogue’s Run Grocer on the near East side of Indianapolis. Why do I love Pogue’s Run? It is Indianapolis' only non-profit, community-owned grocery store. Yes, it’s a co-op, one you can become a member of. You don’t have to in order to shop there, but doing so has its perks, such as that it allows you extra discounts on select items and classes. If you’re really excited about being involved, the potential to be elected to the board if you're a member. Not to mention, membership helps this little endeavor to grow and thrive, which I believe is entirely worth while. I can do all of my grocery shopping there. Its rare that I find a one-stop shop for groceries, and the nice thing about Pogue’s is that they carry all of the essentials. Now, the only disclaimer I will make to this is that they really only carry the “good for humans and the world” stuff, so usually I still buy things like trash bags, zip-lock bags and fabric softener from some of the regular grocery stores. Also, fruit and vegetables are in stock according to what is in season, so once in a while I have a recipe that demands I look elsewhere, but in general not, since they usually have frozen even what they might not have fresh. Price. For the most part, I think Pogue’s Run has the best prices on local and organic. There are a few things that I pay more for at Pogue’s Run, but in general I think it’s worth it. And, if you do partake in membership, the prices on many things are even better. The meats. First of all, I’m only about three years old in the world of fresh, local and organic. I’m not the person who was raised in Birkenstocks and hemp clothes. So for many, many long years, I ate the regular Kroger beef and I thought that was fine. And...theoretically, it was. So, I couldn’t conceive that there would be a substantial different between the stuff at a big chain and the stuff from a local farm. At least...not enough to have a real wow factor. But I was wrong. Very, very wrong. Cooking and eating meat is a completely different experience for me, since I started using fresh and local. I’m not sure I can adequately praise how much better it is, so I would just encourage you to try it, if you don’t already. In conclusion, if you want honest, real food, shop somewhere that has a great relationship with the farmer that the food comes from...somewhere like Pogue’s Run Grocer.